The marketing campaign for Assam 1860 is fun! Tag lines include Tea as it should be, Still plucking, and Chai bagan time. The graphics are great, too. When you visit the website look for the moving parts in the main image. 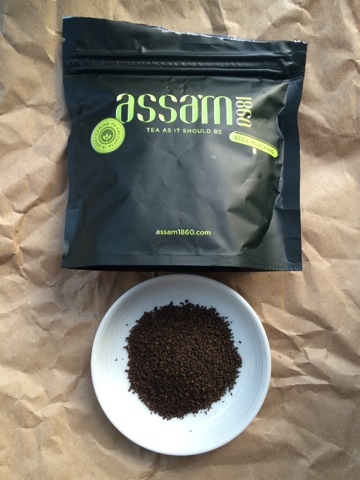 The Assam 1860 package I received for review included several tea bags and a large pouch of loose CTC Assam. The steeped tea is strong in a good way. Brisk but not harsh. The flavours are what one would expect from an Assam. The color of liquor is similar to a Mahogany Crayola crayon or somewhere between the Brick Red and Chestnut Crayola crayons. I have prepared many cups of this tea. It is especially delicious with milk. Malty notes emerge. I wonder what it would be like as a true loose leaf tea. A further tasting note: On the company's website, 2 tablespoons of loose tea per person is recommended with a steep time of 2.5 minutes. I used 1 heaping teaspoon per person plus one for the pot with a steep time of 3 minutes. I think if I used tablespoons, I would need to add sugar, or substitute condensed milk for my whole milk - not a bad idea. 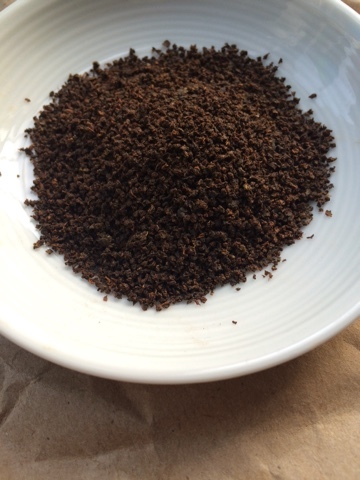 Two tablespoons per person might indicate that I should make masala chai with my Assam 1860. P.S. As this goes to press, I am steeping 2 tablespoons in 8 oz of boiling water.